— According to new research, antidepressants currently on the market are making the sexual dysfunction commonly associated with depression even worse — having a devastating effect on the quality of life for Americans suffering from the condition and driving them into an even deeper depression. 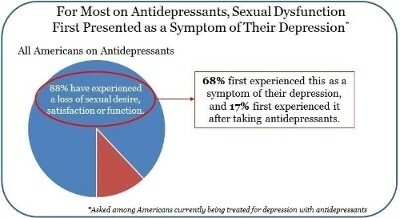 The Sexual Symptoms and Side Effects in Depression (SEXSED) survey was conducted by independent market research consultancy Wakefield Research and provides new data on the experiences of those taking antidepressants and explores the extent to which current antidepressants further exacerbate sexual dysfunction or cause the disorder as a side effect in those not suffering from it before treatment. The survey found that an overwhelming 88% of Americans being treated for depression have experienced a loss of sexual desire, satisfaction or function. And among those who experience sexual dysfunction, more than half (55%) experience no improvement or feel further deterioration since they started taking their current antidepressant. Furthermore, the survey revealed that 73% of Americans who experience sexual dysfunction agree that this negative impact on sexual health has actually made their depression worse. Currently available treatment options for depression, including SSRIs and SNRIs, are not optimal since they often exacerbate sexual dysfunction and further distress patients. These medications also cause the disorder in patients when it didn’t exist pre-treatment. According to new data, 62% of Americans currently being treated for depression who experienced sexual dysfunction as a result of treatment think it is impossible to find an antidepressant without the loss of sexual desire, satisfaction or function as a side effect. Further SEXSED findings show that 90% of Americans report they would consider an antidepressant treatment that had a neutral or positive effect on their sexual health if one were available. The survey was commissioned by Fabre-Kramer Pharmaceuticals, the developer of Travivo™. Travivo™ is a new antidepressant with a novel mechanism that effectively treats depression while also improving depression-associated sexual dysfunction. This is a key differentiator from available treatments and addresses one of the most significant unmet needs of depressed patients and one of the most debilitating side effects that result from current treatments. The product has recently completed a successful efficacy review at the FDA, and Fabre-Kramer is targeting FDA approval by late 2017. “This survey provides a new window into the lives of those trying to manage and live with major depressive disorder, and paints a comprehensive picture of the consequences of antidepressant treatments that don’t also address sexual dysfunction,” said Dr. Anita H. Clayton, Professor and Chair of Psychiatry and Neurobehavioral Sciences at the University of Virginia School of Medicine and a thought-leader in sexual dysfunction with psychiatric illness and treatment. Travivo™ has been shown to effectively treat major depressive disorder while also improving sexual function. This is a key differentiator from SSRIs and SNRIs that are often associated with sexual dysfunction side effects. Additionally, Travivo™ does not cause weight gain or other common side effects associated with antidepressants currently on the market. According to the Anxiety and Depression Association of America, Major Depressive Disorder is the leading cause of disability in the U.S. for ages 15 to 44, and affects nearly 15 million American adults. The estimated direct cost to US health systems in 2015 was over $95 billion, and indirect lost productivity of over $50 billion. The SEXSED survey was conducted by Wakefield Research (www.wakefieldresearch.com) among 1,001 U.S. adults currently being treated for depression with antidepressants, between September 28th and October 5th, 2016, using an email invitation and an online survey. The margin of error for the study was +/- 3.1 percentage points. The survey also revealed that Americans attribute their sexual dysfunction to the reason they have less enthusiasm about life in general (55%) and why they feel detached from friends, family and significant others (52%). Furthermore, SEXSED found more than one in three (38%) of respondents experiencing sexual dysfunction have stopped taking an antidepressant specifically to avoid the loss of sexual desire, satisfaction or function.